Nick Wheeler : TheyWilllRockYou.com – For the love of music! Serving Boston and Greater New England. 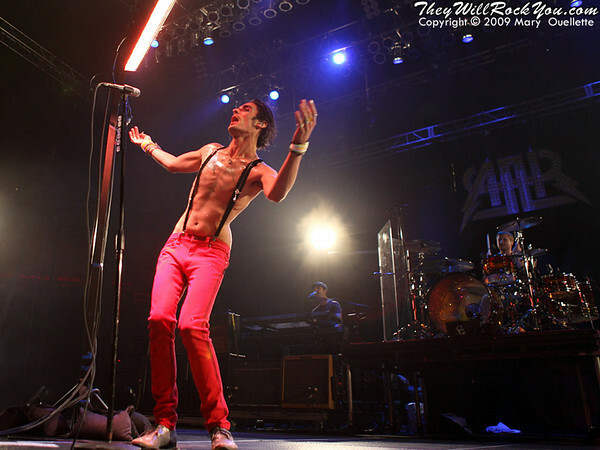 Forget about the countdown to Christmas or New Years, for music fans December is all about the countdown to the new album from The All-American Rejects. For months fans have had December 16th marked on their calendars as the glorious release date of “When the World Comes Down”, the much anticipated third album from AAR. For the band (Tyson Ritter on vocals, Nick Wheeler on Guitar, Chris Gaylor on drums and Mike Kennerty on guitar) this has the makings of being their best album to date, but they won’t make that claim until their fans love it as much as they do. The band took all the time they needed to write the album and just as long to record it, making it a solid album from start to finish. They weren’t going to release it until it was a complete album and to AAR that means great songs from start to finish, not one great single and a bunch of filler. While the first infectious single “Gives You Hell” is already charming the pants off of the music world with its deliciously funny video, the rest of the album offers up hints of the AAR of old as well as some evolution including “Another Heart Calls” – a duet with The Pierces, “Mona Lisa” recorded live in the studio, and the thought provoking “Believe”. Currently playing some smaller club dates to warm up for the album’s release drummer Chris Gaylor took some time to talk to TWRY about the new album and all things AAR.